Facebook or FB is now one of the largest social networking website with millions of subscribers. People of all age, from different ethnic groups and religions are found here. Unfortunately, most of the people who use Facebook don’t even know how to navigate or make use of all applications properly that Facebook offers to them. If you are one of that folk, don’t worry, I am here to help you. Following are given some simple tips and tricks that will help you make your profile appear cool and interesting to your friends. Facebook Chat is really a cool and useful feature in Facebook that allows you to contact your online friends easily. But it often happens that you are not willing to talk to every people online and want to hide your online status from them. In past this feature was not available in the Facebook but now you can hide your online status from certain people. Simply go on to the Chat window at the bottom. There you will create a list of people to whom you want to appear offline. Make a list of people with a name ‘Blocklist’ or whatever you want it to be. After creating a list, drag the people into the list whom you want to appear offline. After adding the people, set your status to offline to that particular list. You will appear offline to those now and you can talk to people you want to more freely. Facebook Toolbar is a convenient way to find, share, check your messages and notifications, and even update your account quite easily. This feature is available on Firefox browser only. If you are using Firefox, simply download the Facebook Toolbar on your computer and install it. Once the installation is complete, you can log in to your facebook account using this toolbar. Also you can use the buttons on toolbar to reach on any specific page such as inbox, applications etc. If you want to create a photo collage of your all friends in your Facebook friend list, you can use several applications. One such useful application is MishMash that you can use to create Photo Collage. It has now become an easy task to upload your photos and videos directly from your smartphones. It involves a very simple process; you just need to subscribe to the mobile Facebook services first to use your phone for uploading photos and videos on Facebook. If you don’t know how to do it, you can search for different forums or blogs telling you the process of sharing photos or videos from your phones. Press Up, Up, Down, Down, Left, Right, Left, Right, B, A, Enter key then press up & down. If it doesn’t work on your first attempt, don’t disappoint, refresh or reload your page and repeat the same process until you get those cool magic circles on your Facebook page. Poking back your friends had never been easy. It is a time consuming process. But now you can poke back your friends automatically by using a ‘User Script”. It is very easy to use. First you have to install ‘Greasemonkey add-on’ on your computer using Firefox. After installing the Greasemonkey add-on, you need to install a ‘User Script’ on your computer. Once the installation is complete, you are done with it. You need not to pock back your friends now; this will be done automatically by this User Script and Greasemonkey add-on. Uploading pictures to Facebook is sometimes a great nausea. It is tough to find photo hosting application that works best to your liking. But here we are giving you one such photo hosting application that has a lot of exciting features including the feature of uploading photos directly to your Facebook account. The application we are talking about is Picasa. 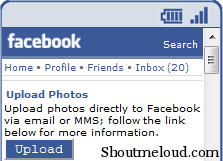 Just install it and add a Facebook button onto it and start sharing and uploading photos using Picasa. You need not to open your friend list or application page to find any friend or application each time. Search box is a great way to find friends, pages, applications instantly. Just type the name into the search box and it will give you the list of that name and you can select the one you are looking for easily. Are you unable to access Facebook from your office because it is blocked there? Don’t worry! You can access your Facebook account from your Microsoft Outlook mail client. You just need to install an FBLook plug-in. this is the only thing you need to update your Facebook status and see your Facebook friends online. You want to bring something new to your Facebook and don’t know how to do it, simply try flipping your Facebook status upside down. It will be a great fun for you and for your friends as well when they try to read your status by tilting their heads. One Response to "10 Very Useful Facebook Tips and Tricks"
Very nice list man! Thanks a ton.